Water continues to change its course and gain power with L'Eau d'Issey Pour Homme INTENSE, a new fragrance that is both captivating and invigorating. The masculinity and warmth of INTENSE illustrates water's force like never before and represents the epitome of power and elegance. Issey Miyake L'Eau d'Issey Pour Homme Intense is available now at Nordstrom in 75 or 125 ml Eau de Toilette. I will update with the notes when I can find them. The fragrance features three contrasting harmonies: a bubbling, explosive surface; a spicy geyser at the centre; and sensual textured depths. Citrus notes of mandarin orange zest, enhanced with bergamot, yuzu and sweet orange, give way to an astringent spice combination of camphor, cardamom, cinnamon, nutmeg and saffron. These are freshened with blue water lily which adds an ozone-like note and the unmistakeable L’Eau d’Issey pour Homme signature. Black incense, ambergris, benzoin and papyrus wood essence feature in the deep, woody dry-down. 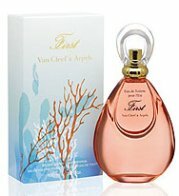 Van Cleef & Arpels has launched First Summer 2007, a limited edition version of their well-known First fragrance, originally introduced in 1976. The aldehydic floral was inspired by coral and developed by perfumer Evelyne Boulanger. The notes include mandarine, cassis, aldehydes, lily, peony, amber and white cedar. An 'intense' version of LeDI? It's intense enough already! Sounds nauseating…although I loved the original when it came out it started to 'grate' on my nose after a while, so I had to stay away for awhile (same thing happened to Calyx by Prescriptives). I can't imagine wanting it to smell 'intense'. Actually, I remember reading that the new L'eau d'Issey Pour Homme Intense is a woody oriental and a totally different beast from the original “nose-grater”. I know what you mean about Calyx, although I still love it. Can hardly remember the original LedI, will have to try it again. There's every possibility that the “Intense” version isn't a stronger version of the original, but a flanker. Look at Dior's Eau Sauvage: Eau Sauvage Extreme isn't more citrusy or stronger than the original, it's a whole different scent. Or O Intense de Lancome; same deal. I like the original Eau D'Issey Pour Homme but everything after that (the indistinguishable summer versions and the dreadful Eau Bleue) has been a disappointment. And now that Le Feu D'Issey has been discontinued, he'll never make a men's version of it, dammit. I'm not going to hungrily hunt down this new Miyake, but if I see it, I'll try it, of course. Quite so — I do wish Nordstrom included more fragrance information on their online store. How more intense can they get with this overused men's scent by the masses. Hopefully it's more woodsy as someone said here. And by the way, I think L'Eau Bleue d'Issey Miyake is a masterpiece compared to the other dreck that's been put out by most mainstream designers and stuff by the likes of Creed. It at least tries to be different and goes against the grain which makes me admire it and love it equally. I'll take all the menthol notes it gives me in the first few minutes. But after that, it's smooth sailing on my skin. It's aromatic wonderfulness, IMO. And believe me, I'll take it all if most don't want it. I don't like Bleue until after several hours — too long a wait for me. But agree it is better than many other things! Also agree w/ P. above — a men's version of Le Feu would be awesome. Actually, don't think Le Feu is particularly feminine. I never thought Le Feu D'Issey was the least bit feminine, and I owned a bottle of it (how could I not have that spectacular bottle? ), until after a couple of years I got tired of it and gave it away, which, of course, I now regret. But I would love to have seen what they could have done using that basic idea as a starting point for a men's scent (just as L'eau D'Issey Pour Homme seems like a natural extension of the women's scent, masculinized), and the bottle would have been amazing. I expect I would have bought it on the spot.